Trying to find the truth should be simple. It can be, depending on which truth is being questioned, 2 + 2 = 4, the earth revolves around the sun, white is not a color, it is the absence of color. These are all simple truths, arrived at by a much longer, more arduous process. The “Truth” is never just the truth. It involves the collection of data that is questioned and tested and then questioned again. Eventually, some form of consensus is arrived at and, in time, it becomes the common wisdom held by almost everyone. Whether it actually is true or not, is another matter altogether. Many commonly held ideas are nothing more than theory. Einstein's theory of relativity, for instance, is essentially pure theory. So are black holes. “Time” is another idea that may or may not be real. In spite of all our clocks and calenders. What is “Time?” No one really knows. There are plenty of theories, but very little hard data. In fact, when it comes to many of the “Big Questions” “We aren't close to being close to answering them” to quote author David Berlinski, a PhD in mathematics and biology. You'd never know this when listening to the experts talk. It doesn't pay to be vague, it pays to “Know.” If not with absolute assurance, then tenacious certitude will do. The truth may be that we simply don't know much at all, not really. Certainly nothing like what we claim to know. Not about life or it's “True” meaning, about its origins, about death, about how we got here, about why there is something instead of nothing. In fact, the one constant in all of this is ignorance. Although few will ever admit it. Recently, I caught a part of the new version of the old TV series “Cosmos” hosted by Neil DeGrasse Tyson. 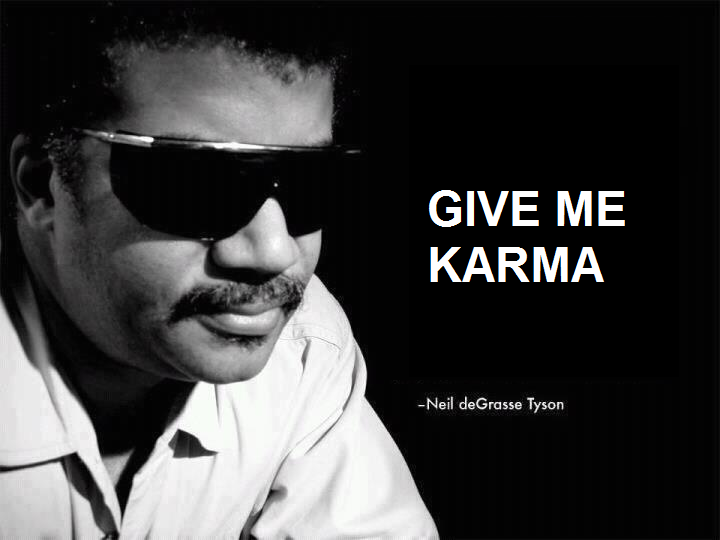 Tyson suggested that it wasn't God that created the universe, it was gravity. This was a not-too-subtle shot at religion and a big thumbs-up to science. Wasn't it a scientist that discovered gravity and not a priest? What Tyson never said, though, was exactly what gravity really is. Why should he, we all know what gravity is. Without it, we'd fly off into space. If no one ever sees gravity, tastes it, touches it, like you would any other real object, it's still real. Right? Gravity is an invisible force that exists, that much we know, but what it really is, why it is, or why it should be, is largely unanswered. In reality, none of these queries have been answered by anyone, not even by our most highly regarded scientists. There are lots of theories, but precious few facts. Gravity appears to simply be there. Where? Everywhere! It governs and makes possible our universe, but it didn't create anything. There isn't a hint of evidence that gravity has any creative power, any intent, anymore than electromagnetism, the nuclear strong and weak forces and dozens of other absolutely necessary elemental forces do. They are simply there. And, they are so finely tuned that, if their values were changed to a degree almost imperceptibly small, everything would collapse; all life, all matter, every planet, galaxy and solar system would collapse as well—even time and space. It would collapse at the macro level and the micro level, right down to the quantum universe, which appears to be governed by its own set of mysterious, poorly understood laws. The Hebrews said that “Law” is at the very heart of God. What did they mean? Did they mean God was legalistic? No! They meant that “Justice” was the nature of God; that God was reason—reason being indispensable in the administration of justice. Out of this flows the concept of “Reasonable doubt.” What this really reflected was a radical new idea, that God could be known by observing his creation. Because God caused the rain to fall on the just and the unjust equally, it indicated that God must also be merciful. He fed the birds of the air and the beasts of the field. Not that he did this directly, but that he made it possible. He created a universe of sowing and reaping, compelling all to sow generously, that all might reap abundantly. Not a world of magic, like the gods of the heathens who caused the rain to fall because they had been paid off with sacrifices, but a world of order. One that could only be understood by reasoning together—one with another—and with God. The Hebrews, like their neighbors, began with sacrifice as a means of appeasement. Eventually, they concluded that it wasn't sacrifice that God really wanted, it was obedience, self-sacrifice, justice, mercy, love for ones neighbor, even one's enemies—applied equally to the poorest members of society—not only to kings or to the rich. The Bible is not a book of magic, not a “How-to manual.” It is a book of history, written the way ancient people wrote history. Not as we write it. It is a warning and a love letter. It reflects the human struggle from its earliest stages as hunter gatherers, to the emergence of the first agrarian societies that made civilization possible. It is the only book of its kind. Whether it is all “True” in the modern sense, misses the point completely. It is true where it counts the most; in its ideas, as a foundational document of the first great human code of conduct. One that was intended to govern everyone equally, prophet and king, shepherd and laborer alike. It is a core piece of the puzzle in the emergence of what may have been the first true, egalitarian theory of democracy. Without it, America and Europe would not exist, not in their present form. The Bible does all of this imperfectly, mind you, but who should expect it be otherwise. It is, after all, the very real and human story about man's struggle to move out of the darkness and into the light, with God as the true source of all enlightenment and knowledge. To reduce it to a “How to get God to do your bidding book” is to reduce it to something much less than what it is—and God with it.